Nebraska’s had a busy week on the recruiting trail, bouncing from satellite camps in Texas to Georgia to Florida and stops in St. Louis and California still to come. That’s a lot of hours logged, but it has resulted in some returns. Here’s a quick recap of the latest recruiting news on the Husker front. Nebraska’s camp tour resulted in another offer to a 2019 prospect. Cornerback Jaden Davis tweeted a Husker offer right from the Florida International campus, the Huskers’ evening stop on Thursday. No ranking yet for Davis, but with an offer list that includes more than 25 teams—Miami, Florida, Michigan and Ohio State among them—it’s safe to assume you’re looking at a 4-star. Much of Nebraska’s focus has been on 2019 prospects on this satellite-camp swing, which is probably based on numbers. The Huskers are in good spots with a handful of 2018 players and there aren’t a ton of slots left in what will be a small class. Speaking of which, 2018 running back Mychale Salahuddin, a high 3-star (89.2), included the Huskers in his top 11. Lastly, meet Dwight McGlothern, a 2020 cornerback out of New Caney, Texas, who looks headed for 4-start status with an offer list that already includes LSU, Georgia, Ole Miss and Tennessee. McGlothern, whose Twitter profile picture either features him Photoshopped into a Nebraska uniform or a photo of Chris Jones from last year's Northwestern game (tough to tell), seems to like the Huskers quite a lot of late. 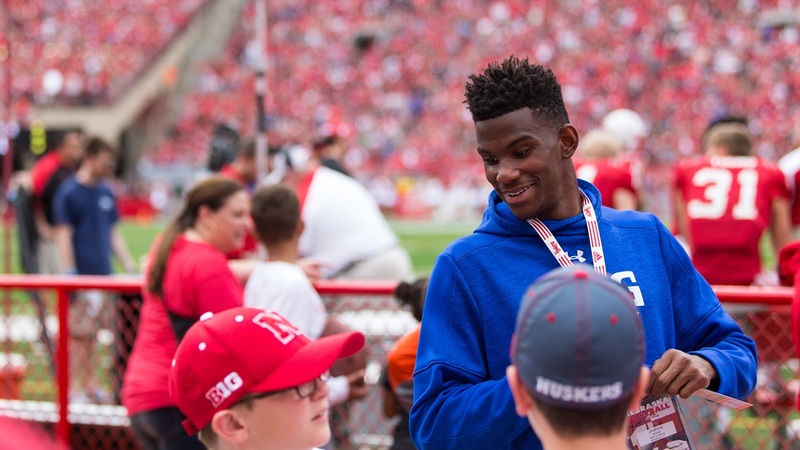 And he’s also claiming inside info on Nebraska’s biggest recruiting decision of June, the upcoming announcement of 4-star wide receiver Joshua Moore. Add that to the growing pile of evidence that wide receivers coach Keith Williams might be the Huskers’ hole card here. Pro Football Focus is always good for some tweets you just sort of have to accept at face value. This one probably won’t be hard for Husker fans to swallow, though possibly something of a surprise. Bob Diaco’s defenses were more good than great tackle-for-loss and sack teams over the past seven seasons, which aligns with an overall philosophy that prizes preventing big gains over negative plays. “Block destruction is a little different system,” Diaco said this spring. “It’s different fundamentally. The work done at the line of scrimmage, not behind it on either side, is a critical component and a real important piece. That said, a player who could remain assignment-sound and still produce some negative plays, potential Akinmoladun flashed during the first four games of his freshman campaign, would be far from a bad thing for the Blackshirts to have in 2017. ESPN has Nebraska as a team poised to spring an upset (at Penn State) and a team poised to be upset (at Minnesota). Where Bob Stoops ranks among this era of coaches. Rob Riggle as Bret Bielema? J.K. Simmons as Nick Saban? Can this early-summer listicle get nominated for an Oscar for casting? Love me some counter trey, and it's a big part of Lincoln Riley's scheme.